I had never heard of the SC Comic Con. But when I learned about it, I knew my weekend destination! The SC Comic Convention took place at the TD Convention Center on the weekend of March 25 and 26. I arrived at about 2:00, and was greeted with a LOOOOONNNNGGGG line for admission. Luckily, the line moved quickly, and by 2:30 we were in. People were dressed to the max…I was wearing my humble Ace the Bathound shirt from the Legion of Collectors Box. But there were cosplayers everywhere. I do have a frame of reference for comparison. The SpartanCon is little more than an event at the public library, where they have some authors and creators show up. It packs the library. Which isn’t small, but isn’t humongous either. I used to attend the MonsterCon. That was sizable, taking up floorspace at Furman University. And then HicloryCon was even bigger than that. But this event DWARFED those. Never have I seen so many vendors, artists, photo opportunities, and shop representatives in one place. Me and the SpartanChildren walked around the place first, to take it all in. Then we started getting specific. SpartanTeen didn’t want to be there…he wanted to stay home and play Battlefield 4 all day. But the SpartanKid wanted some MegaMan stuff, and I was looking for sealed MTG product, as well as Masters of the Universe related items. The quest for MegaMan was dismal. Right now, he just isn’t that hot of property, apparently. We found a place that had five different stuffed MM toys. But the SpartanKid passed on those. He has one anyways…stuffed things really aren’t his thing anymore. Eventually we found a metal bookmark. Shiny! 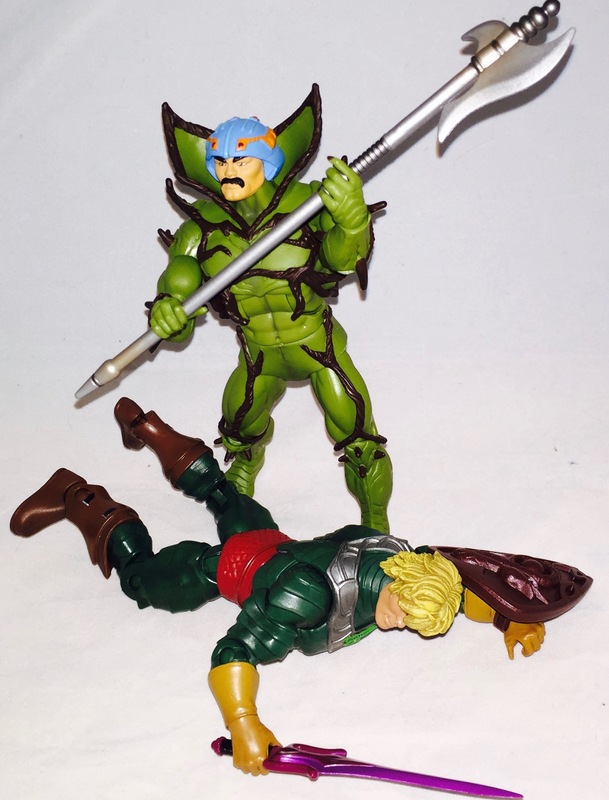 The quest for MOTU was hardly better. I eventually DID find some vindage items, but they were asking WAY TOO MUCH. Basically, polybagged figures for $20. I did see some other cool toys. One standout was G1 MEGATRON in package. Yes. The PISTOL version! $300! IN BOX. G1 MetroPlex was there as well, with a $600 price tag. It didn’t appear to be complete either. There were a few GI Joes of note…Cobra Commander, Zartan, and others. It came down to sort of impulse buys. I ran across the ATRAXA, PRAETOR’S VOICE deck, but in JAPANESE! The vendor said $59. I said I might return, and I did. Homeboy tried to bump the price up to $79.99. But nope. I got it for $59. This is a deck I have been waiting to land at a big box store, knowing the uninformed workers at Wal-Mart and Target either don’t know or don’t care about the asking value. But I keep checking. And no luck. But to find this at the con, and in a foreign language, to me that is AWESOME. I have a review coming soon! I will definitely be going back to SC ComicCon. It was fun for me and the SpartanKid. And something cool to do! Snow in the south. What does that mean to the SpartanNerd? While others slide their way to work…skid their way to the factory…get stuck in piled up traffic on their way to punch the clock at the warehouse, or to worry sick about the progress at the house building site, the SpartanNerd stays home. Teaching has its perks! And while even other teachers might get bored, sitting in their wool socks binge-watching the Netflix, the SpartanNerd stays busy…bringing nerdtainment reviews to the masses. (Whoever you are, beloved readers, thank you!) Someone out there reads what I publish, and this run of reviews is just for you! The Masters of the Universe Classics Battle Ram came in this shipper box. This box is huge. And when I see this giant mailer, I realize how big a MOTUC vehicle has to be to accommodate that nearly seven inch scale. I have some other large MOTUC items. But this is set to be the largest yet! I am re-using this box this time, to cart my vintage figures back over to the school to put on display for the rest of the school year. (Now I have to make room in the Nerd Closet for this beast of a vehicle!) It is nice and sturdy, and suits all kinds of re-use purposes. I know, there are some collectors out there who have each of these in storage. Come on guys. Really? Just. Why? You can see all of this goodness is really crammed into the box. Man-At_arms is prominently in front of the vehicle. Maybe an odd choice? They could have seated him on it and maybe saved some space? But I suppose having the figure displayed in the window box is more important to MOC collectors. The back of the box shows a diagram of the Battle Ram with some details. It even goes as far as to point out that the Griffin Head is the custom piece done by Duncan. This diagram is going through a little bit of pain to point out that the Jet Sled in front isn’t the same as what’s in the package, I think. The other details are cool. Isn’t Gwildor of the Tadorian race? Or is that what creature’s head is depicted on the missile? Thankfully, I managed to free the scary piece of hair without damaging it. And here is the product, as vanilla as I can show you, right out of the package. Now readers…I am going to post the review of Man-At-Arms in a different post. This figure deserves a fair review like all of the others, but I am afraid the Battle Ram is so awesome it overpowers old Duncan! Here are some other large MOTUC items I have just for reference. (I hate this picture). As in the vintage model, the Jet Sled detaches from the Battle Ram portion. The MOTUC version doesn’t do so as easily, however. You have to wiggle it with a little bit of force, and there is a definite “SNAP” sound that happens, as the tabs that lock it into place seem to be stressing a little bit. And that is my only complaint about the entire vehicle! 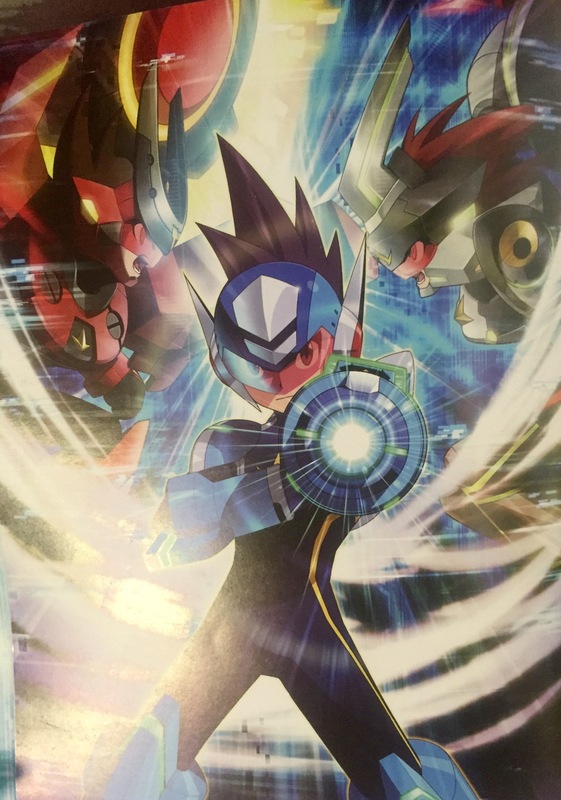 You can see that this time we have the snake head version of the Sky Sled. (War Sled, props to James Eatock). I won’t be displaying the Battle Ram with the snake head. I’m not sure if the snake head version is ever depicted in media attached to the Battle Ram? I will always have the Griffin head version on the front. Teela makes everything look better! Sky High villainously belongs on the snake version. Or you can go 1980’s playtime, full on! Check out the backside of the Battle Ram. Every single knob, control panel, exhaust pipe, vent, indicator light, engine piece, all of it. Fantastic sculpting. I can’t gloat about that enough. It is incredible! It is this work that makes Masters of the Universe Classics the ultimate toyline. Not only just for adult collectors, but this item in the hands of a kid…wow, it can capture their imagination. Now for that “Comparison Time” I hooked you with earlier. My childhood Battle Ram is dwarfed by the MOTUC version. The plastic is just about split in seam right up the middle of both the Sky Sled and the engine piece. One thing about them both, and maybe only I notice this because I am the only music teacher interested in MOTUC in the whole entire world I am certain…both Battle Rams make the same sound when they roll! This was the very first thing I noticed. As soon as I freed it from the box, I set it on the floor and gave it a good push. There is a certain “hollow” sound to the thing as it rolls. I’m not sure what makes it so. But it is. It is the exact same experience. When I rolled the new vehicle across the floor, a ton of memories flooded back into my head. I mention how this is the ultimate action figure line…how kids can totally have their imagination captured. Us adults can re-live it because of the incredible detail put into something as awesome as this. The SpartanNerd rates the Battle Ram at 5/5. It is perfect! The only thing close to a complaint that I can make is that it is slightly hard to separate the Jet Sled from the Battle Ram. I believe that over time that may work itself out. So no big deal. The SpartanNerd rates the Battle Ram 5/5. Do you agree or disagree? Let me know in the comments! Yep. The SpartanNerd is getting on up there in age! 250 posts. There have been ups and downs. I have covered “all things nerdtainment” that I could afford. I have made mistakes, as well as hit home-runs. I’ve had times of not being inspired or having energy or time, as well as times where I felt a real need to blog. I thought I would celebrate this milestone with a little pastiche of different stories of interest! 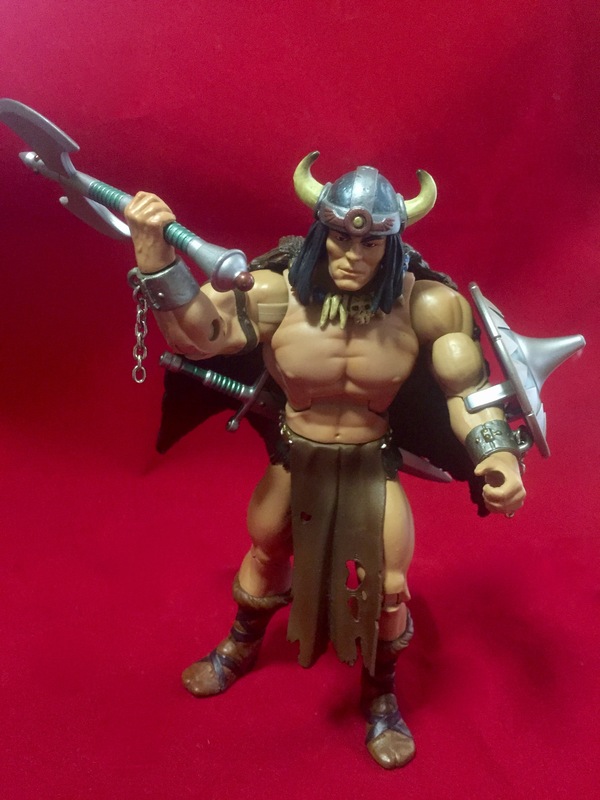 My first ever customized MOTUC figure. My own Teela, of course! It has bothered me for some time that I didn’t have a female figure worthy of wearing the extra bit of snake armor that came with one of the weapons packs. I always felt that it could fit Battleground Teela; I was reluctant to remove her hair. Well I’m glad I did. You can see from the picture that it worked out pretty nice. It took me over an hour of using a hair dryer and other tools to remove the hairpiece, which is really a hard piece of plastic glued on with some incredible adhesive. Unfortunately, it left a hole in her head all across the back. You can’t see it from the front, which is what is important to me. I might try and customize a backside to the hood sometime to completely cover the ugly. Yes, I can put the hairpiece back on! So its like I have two Teela figures now! pfffttt to all you people who own one figure that cost over $100! I know what else you’re thinking, and yes I DID remove the bra-armor piece to see if I could make her appear more comic accurate. 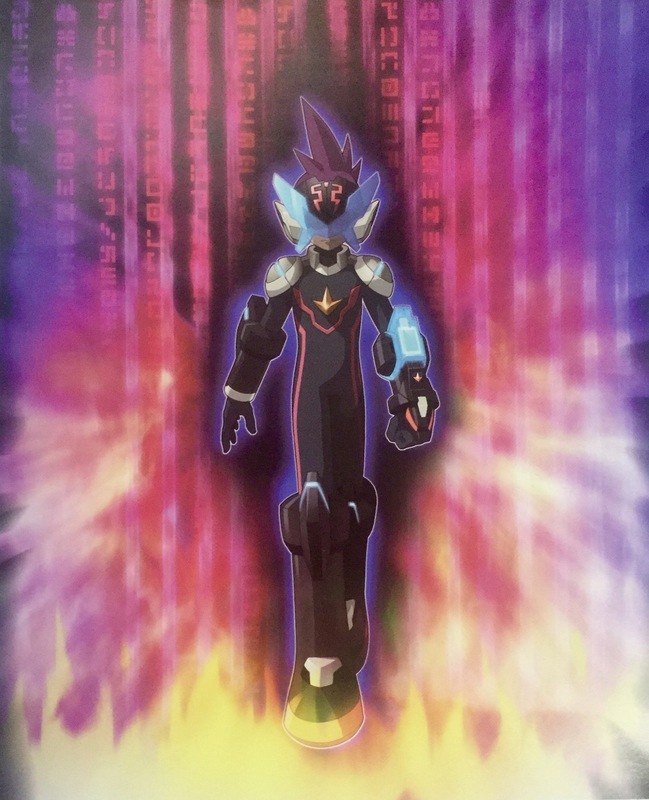 The problem is…it just doesn’t look right on this figure. She seems too…Well, your eyes go right to her bust. And then it doesn’t look right. She isn’t “that accurate,” ahem. She looks better with her stock armor underneath the hood piece. And no, I’m not interested in doing ANY painting on this figure! The SpartanTeen hasn’t played Magic the Gathering in quite a while. This is fine. I have had to find other ways to bond with him. One of those ways is the appreciation for Gundam models. Here is a pic of his best two. He got the flight stands in the mail, and put them in this pose. We kept them this way on the kitchen table for several days! 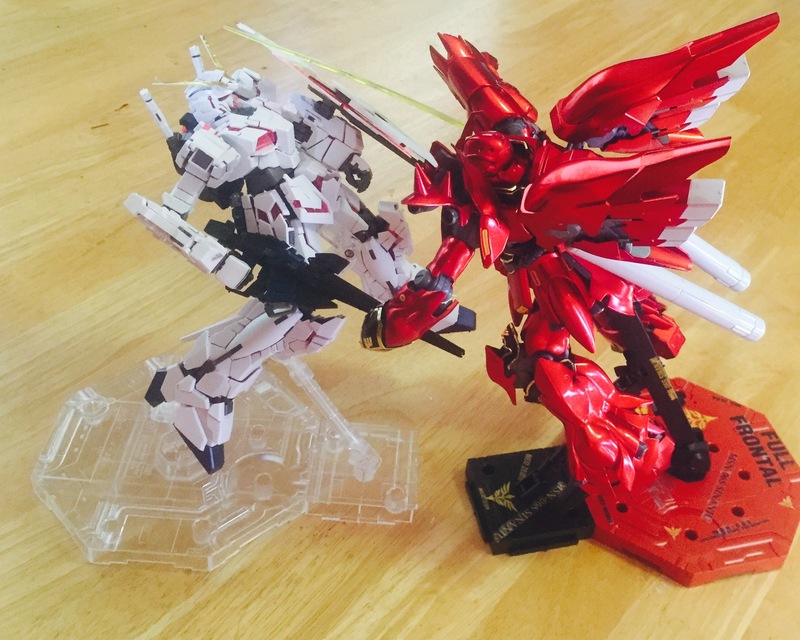 I love the action that you can sense between the two characters, Gundam Unicorn and Sinanju. 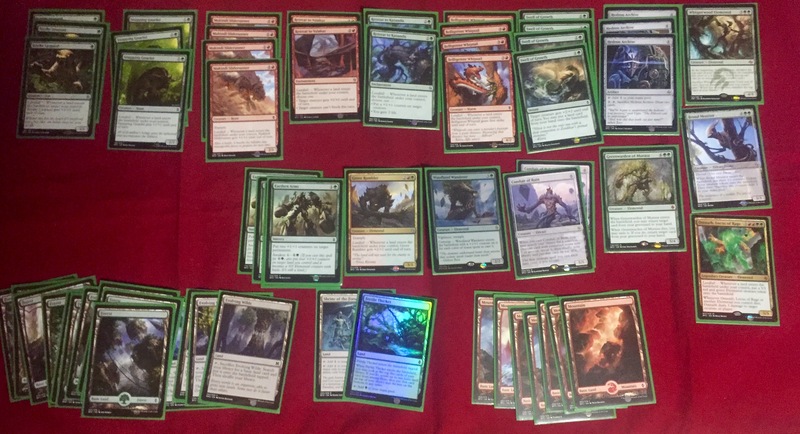 I bought a box of Battle for Zendikar. And I have been incredibly pleased with my investment. I don’t generally buy cards for their monetary value, but you just can’t overlook it when each pack gives you a full-art land, (in time will be worth $1.00-$2.00.) But aside from that, you also get a rare as in every Magic booster. But I have been blessed. The SpartanKid also built a Standard deck (with my help)….He is quite pleased with it. The only thing we tried to do really was use the colors of Omnath, Locus of Rage. We put a lot of landfall in there. And Scythe Leopard and Sliderunner have done all of the work pretty much! 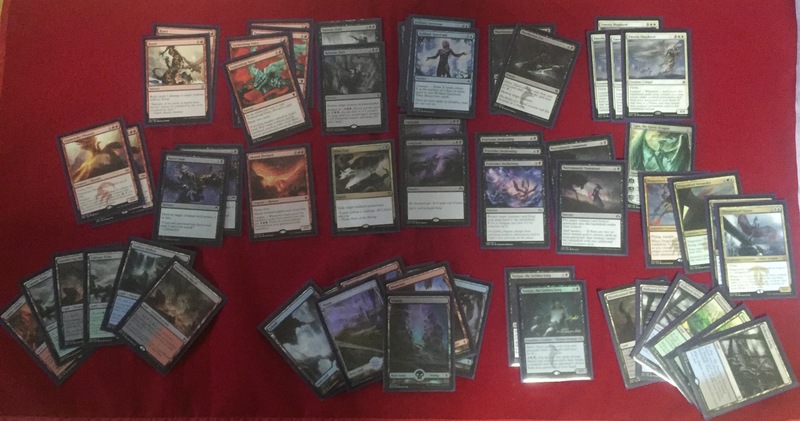 While on the subject of MTG cards and customizing stuff, check out what I did with my Father’s Day present…I made a Commander deck, and used the inadequate deck box that “Graveborn” came with to pretty up a Commander box! 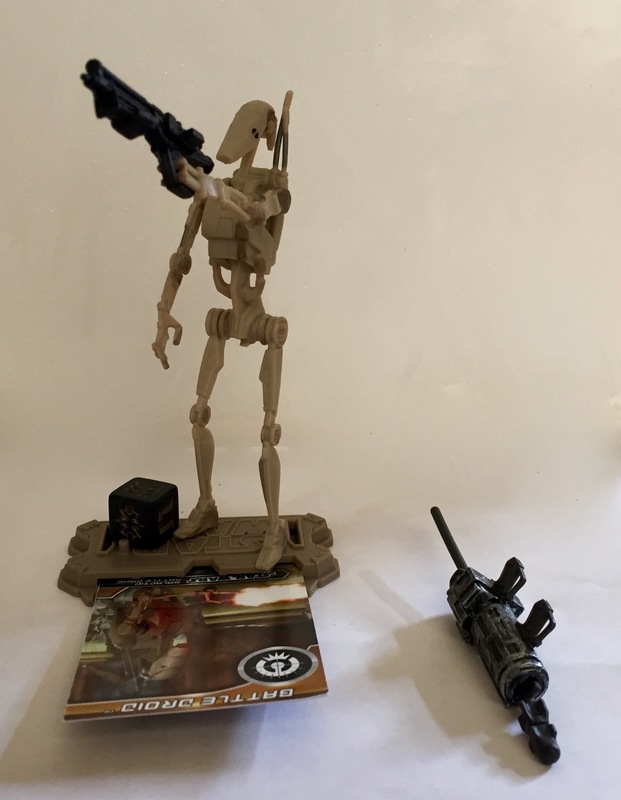 I bought a Battle Droid figure at Mighty Dollar for $1.00. The full real thing! I purchased and intended to review the Deckbuilders Toolkit for Magic Origins. Maybe I still will. But I’m not feeling it. 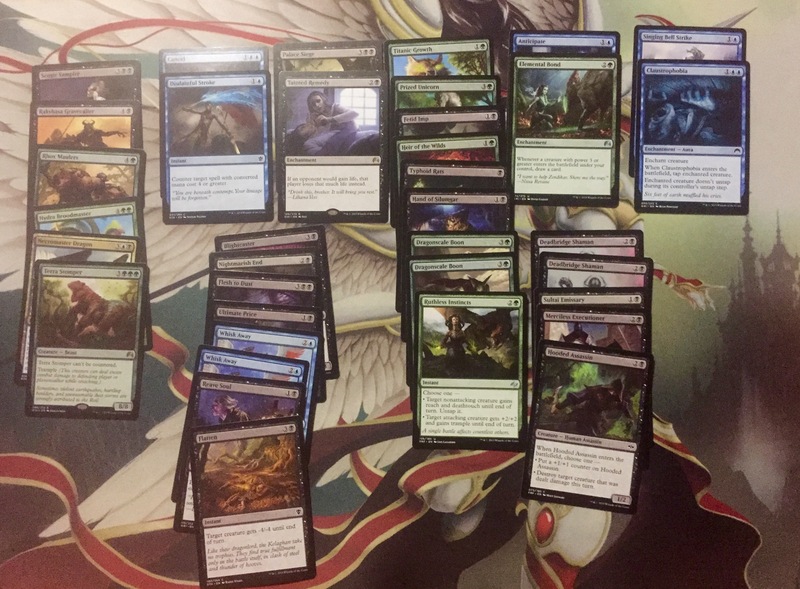 Here is a pic of the janky deck I put together with it though! 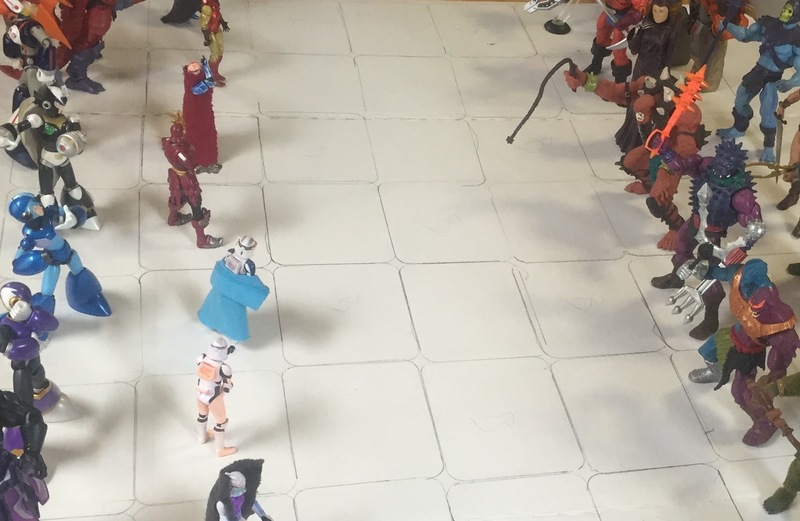 I made a chessboard for MOTUC and similar figures! Don’t steal my idea! You get all of this variety of Halo mini-figures. And a ton of weapons. It comes with a display stand to boot! 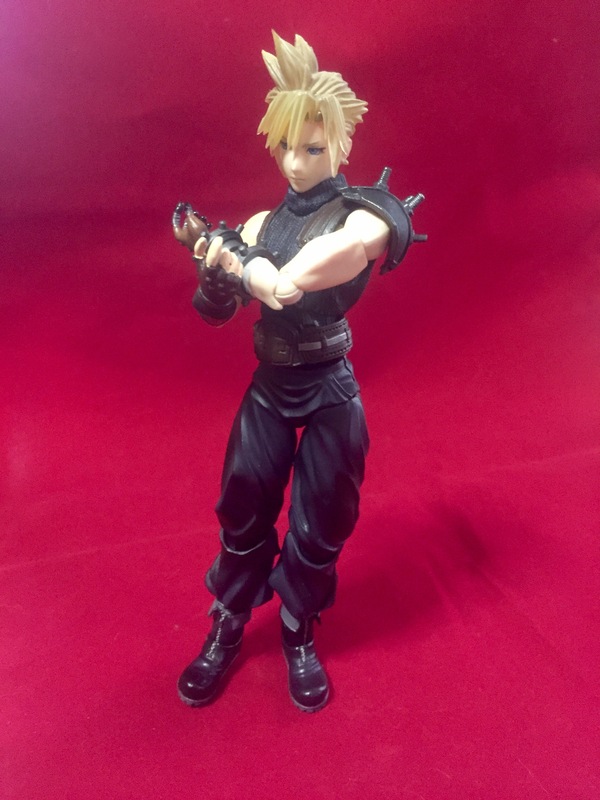 Remember the unfortunate situation with this very expensive figure…. He is still holding up after all this time! His wrist hasn’t let go even once! 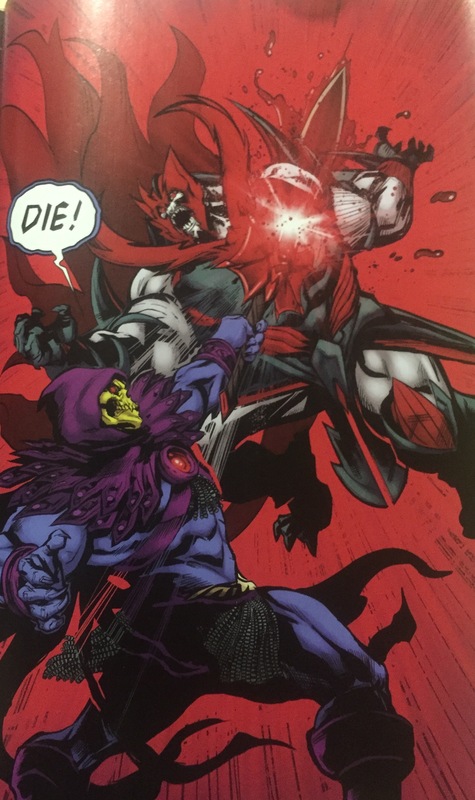 I about shouted for joy when I saw this page of a recent He-Man and the Eternia War comic! That comic keeps surprising me with its twists and turns! A review of issue #10 is coming soon! 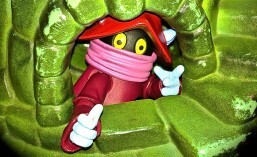 Vikor remains my favorite MOTUC figure. Maybe my favorite action figure of all time. While I give serious props to Marvel Select Deadpool, Vikor is continually all that an action figure should be. Incredibly detailed and articulated. Fits any fantasy. Is a MOTUC design. Armed to the teeth. I love to photograph him! So will the SpartanNerd make it to 500 blog posts? Time will tell! Hopefully the upcoming Star Wars season doesn’t make me go broke! I keep getting tempted to purchase new things. But I have decided that I will only purchase the best things. So keep reading, Hub City Geeks!